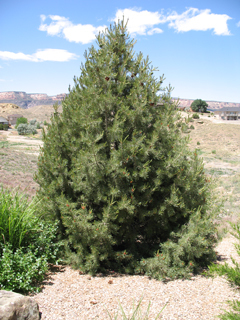 Pinyon pine is a native conifer growing throughout the four states occupying the four corners region of the Southwest. The common name for this tree comes from the Spanish word piñon, which refers to the large seed of the pino (i.e., pine). 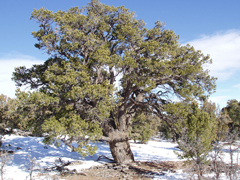 This tree is commonly found growing in association with several species of the juniper group. 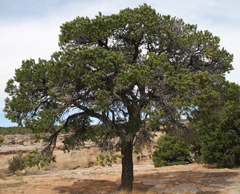 This growth association is commonly referred to as the pinyon/juniper woodland, or simply P/J. Hardiness Zones 3 to 7. 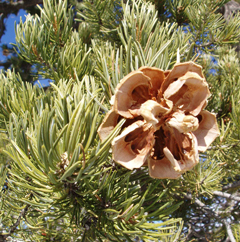 In its native habitat this tree grows at elevations of 4,000 feet to 8,000 feet. In their native habitat individual trees can be up to 500 years old. Growth habit Pyramidal growth habit with dense foliage when the trees are young. As the trees mature they become very irregular in growth habit. After many years the tree can reach a height of 30 feet with an equal spread. Foliage Needles grow in bundles of two, rarely singly or in threes. These evergreen bundles can be one to three inches long. The color is light green. Remain on tree 3 – 9 years. Fruit Cone production usually begins after a tree has reached twenty-five years of age. When available the seeds can be up to a ½ inch in length. These seeds are edible and prized by both animals and man alike. Because the seeds do not have a wing like most other pines they are not disseminated by the wind. Seed dispersal is dependent on several species of jays. 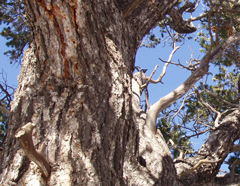 Young pinyon seedlings need protection from harsh environmental conditions so they are often found growing in the shade of native shrubs or downed trees. Bark Young trees have irregularly ridged bark. As the tree matures it becomes furrowed and somewhat platy. The bark color is brown to grayish black. Twigs Bark on young twigs is very rough and light to dark gray in color. Landscape value This is a very popular tree in urban landscapes especially where a small evergreen is needed for a dry site. Most pinyons available through retail outlets are collected from their native habitat. This is a full-sun tree.